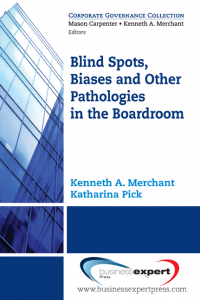 Katharina Pick has been engaged in research on corporate boards since 1998. She has interviewed over 100 directors, written seven Harvard Business School (HBS) case studies on corporate governance, provided fieldwork for two books on boards (Back to the Drawing Board, Carter and Lorsch 2004; Building Better Boards, Nadler, Behan, and Nadler 2005), and conducted two original qualitative research studies on boards for her PhD work. She has presented annually her work on boards at the Academy of Management Conference, has lectured in the HBS executive program Making Corporate Boards More Effective, and most recently has taught in the Corporate Governance MBA course at the Drucker School of Management. From 1999-2003 Katharina helped facilitate the “Global Corporate Governance Initiative,” an annual 3-day gathering at HBS of an elite group of 20 directors and CEOs of large global corporations from Europe, Asia, and North and South America. The gatherings were intensive, full-day discussion sessions focusing on the financial, legal, structural, and behavioral aspects of corporate governance systems and board functioning.